Luna’s surgery team, from left, anesthesia technician Madeline Murphy; 4th-year veterinary student Halle Thomasch; surgical resident Dr. Christopher Lee; soft tissue surgeon Dr. Harry Boothe; Soft Tissue Service surgery technician Haley Pritchard; 4th-year veterinary student Andrea Hoover. Dr. Jacob Johnson (not pictured) served as anesthesiologist on the case. Small patients are nothing new for Auburn’s College of Veterinary Medicine, but a recent case is believed to be its smallest one to date to undergo Patent Ductus Arteriosus, or PDA, surgery. The owner and tiny dog flew a long way, more than 2,600 miles, to have the procedure performed. 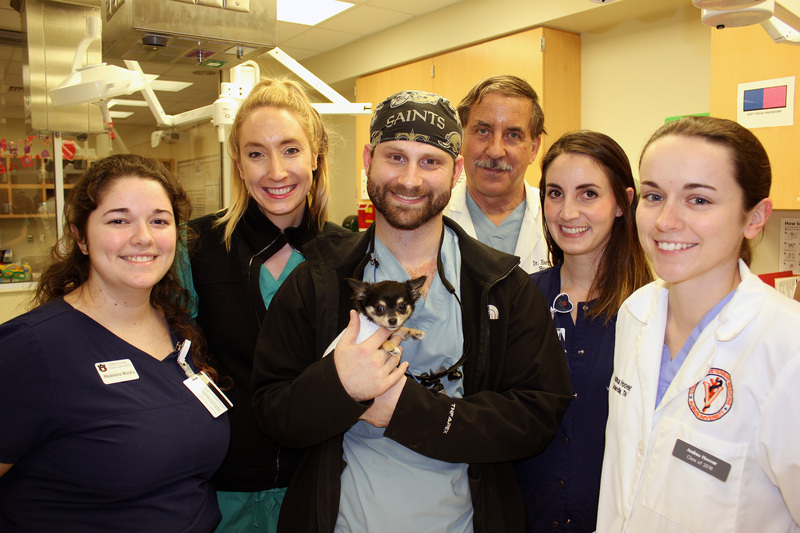 Weighing less than two pounds, Luna, three-month-old, double-coated long-hair Chihuahua, came to Auburn as a referral patient from her Seattle-based primary care veterinarian. Luna’s owner, Jennifer Glover, says that as anxious as the process was, she is forever grateful to Auburn and to her Seattle veterinarian for saving her pet. Patent Ductus Arteriosus is a fairly common congenital heart defect that occurs in about 3,000 newborns each year in the U.S., and it is also common among dogs. Clinicians and staff at Auburn’s Wilford and Kate Bailey Small Animal Teaching Hospital treat a number of PDA patients annually. Luna and her owner Jennifer Glover of Seattle. 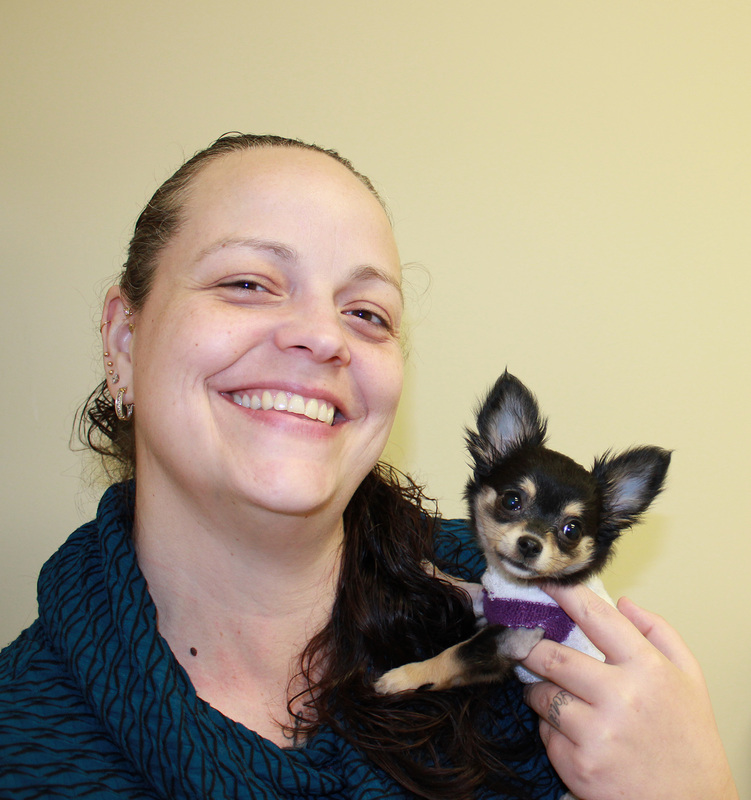 Weighing less than two pounds, Luna, three-month-old Double-Coated Long-Hair Chihuahua, came to Auburn as a referral patient from her Seattle, Washington-based primary care veterinarian. Luna’s owner, Jennifer Glover, says that as anxious as the process was, she is forever grateful to Auburn and to her Seattle veterinarian for saving her pet. Luna, however, was a special case because of her size. At just 0.8 kg—or about 1.76 pounds—Luna was treated slightly differently to compensate for her size, said Dr. Harry Boothe, a veterinary surgeon and professor of soft tissue surgery in the Department of Clinical Sciences who led the surgery team. “Surgery in small, young patients is a challenge from both an anesthetic and a surgical perspective,” Dr. Boothe said. Despite Luna’s small size, however, Dr. Boothe said the procedure required very few special procedures or techniques. “The exception [was] that a retractor that is typically used to separate the eyelids in horses was used to separate Luna’s ribs during the procedure,” he added. “A standard rib retractor would have been much too large to use in this situation. When the puppy continued to exhibit signs of the illness, her veterinarian conducted an Echo test and, from that, determined that the tiny dog suffered from PDA. PDA occurs when a temporary blood vessel—the ductus arteriosus—fails to close after birth. In a normally functioning heart, the pulmonary artery carries blood to the lungs to collect oxygen. The oxygenated blood then travels through the aorta to the rest of the body. In the womb, the ductus arteriosus serves this function by providing oxygenated blood directly from the mother. The arteriosus should close after birth. PDA occurs when it fails to do so. Symptoms vary in severity from mild to potentially fatal congestive heart failure. Sometimes it might even go undetected until maturity. Most often, however, surgery is required to correct it. In Luna’s case, Glover said the prognosis for a normal life span if left untreated was not good. Several telephone consultations were involved leading up to Luna being admitted for PDA surgery at Auburn. Glover brought Luna from Seattle and the pup was admitted to the Bailey Small Animal Teaching Hospital on Feb. 8. During the procedure, Dr. Boothe was assisted by the Soft Tissue Surgery Service team: surgery resident Dr. Christopher Lee and surgery technician Hayley Pritchard, surgery; anesthesia was conducted by Dr. Jacob Johnson, an associate professor of anesthesia and pain management, and technician Madeline Murphy; and fourth-year veterinary students Halle Thomasch and Andrea Hoover also participated in the surgery. Luna was extremely small even compared to case studies nationally, according to Dr. Boothe. Information cited in a large retrospective study of dogs with PDAs (more than 500 cases) published in 2014 listed their smallest patient being 1.8 kg and their youngest patient being 3.3 months. Luna weighed 0.8 kg and she was 2.8 months of age at the time of her surgery. Glover stayed with her pet in Auburn for two weeks prior to the procedure and for Luna to receive a post-surgery examination and evaluation. Luna received a clean bill of health and was discharged Feb. 12. Luna’s medical team recommended that Luna be evaluated by her primary veterinarian in six months, but added that the tiny Chihuahua should recover completely from the condition and live a normal, healthy life.